This lamp represents the first design of sodium lamp which could operate without the need for a continual current flow through its electrodes to maintain them at a satisfactory temperature for optimal efficacy. This greatly simplified the requirements of the electrical control gear and set the standard for all future low pressure sodium lamp designs, whose electrode construction remains virtually unchanged today. Towards the end of 1932 it superseded Philips' previous lamp design, the somewhat better known DA-90 whose construction was basically the same, the only major difference being the requirement for cathode heating. The earlier DA-90 was a 90-watt lamp with approximately 10W being required to heat the cathodes. A special multi-pin cap enabled the electrodes to be independently heated. The power of this DO-80 lamp is lower on account of the fact that the electrode heating had been dispensed with. The cap was also simplified at this time to a simple E40 screw type. It is believed to have been introduced at the end of 1932, but this is difficult to confirm because it is not documented in any known literature. However this would seem likely since by the end of that year, it had itself been superseded by the SO family of low pressure sodium lamps. Incidentally the 'D' in the name of these lamps refers to the fact that they have double-folded discharge tubes. 'A' signifies the original cathode design which required a continual heating current, while 'O' denotes the oxide-coated electrodes which are heated only by the discharge itself. The O-type cathode soon proved its superiority, and continued to be used in the single-folded (type S) discharge tubes in the SO series lamps which superseded this type later in 1932. 2) Catalogue of the Historic Lamps, Philips Eindhoven Collection, c. 1950. 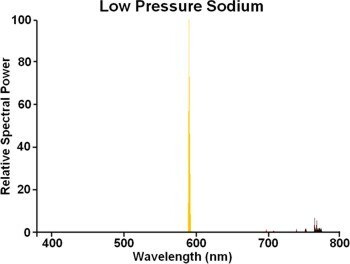 3) "The Sodium Lamp : From Lab Experiment to Street Lighting", E.G. Dorgelo & P.J. Bouma, Philips Tech. Rev. Dec. 1937 V.2 No. 12 pp.354-360. 4) Elektrische Gasentladungslampen, W. Uyterhoeven, Julius Springer 1938, pp.216-218.